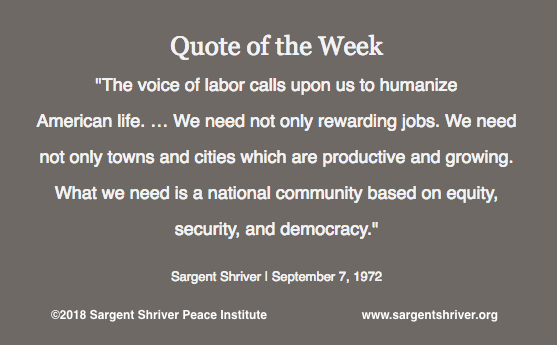 Our Quote of the Week celebrates Labor Day with a call to the humanizing of American life. With this call, Sargent Shriver recognizes the importance of work in our culture, and, given this importance, he emphasizes the need for work to be satisfying, reasonable, and equitable. In a speech given 46 years ago this week, Sargent Shriver addressed American workers and articulated all of the issues facing labor that he saw at the time. During this period, Sarge was the Vice Presidential candidate on the McGovern campaign. He stressed the importance of having adequate employment and good wages, but said that these were not enough, that in order for people to thrive, it was the quality of their work that mattered. Focusing on job productivity, safety, and the rapid changes that technology was bringing, Sarge emphasized that there was much more to job satisfaction than merely being employed. It is in this context that he spoke about humanizing American life. Although we are living in very different times, we believe that Sargent Shriver's points about work are as vital as ever. We wish you a restful and satisfying Labor Day.